Hazardous Holes In Wigan's Crust. 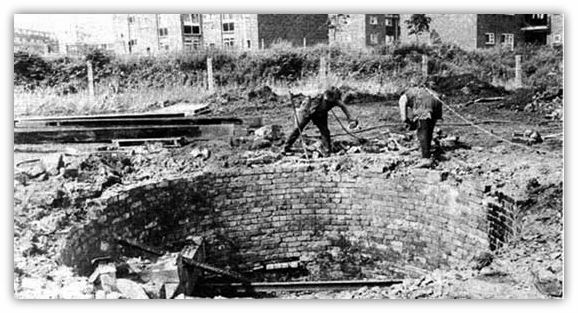 The preparations now going on around Mesnes Street for the redevelopment of Wigan town centre are sure to face Wigan Council engineers with a few headaches, not least of wihich are the are long forgotten holes and pits dug by our coal mining ancestors. You should, for instance walk softly down Mesnes Terrace, off Mesnes Street for it was there exactly 75 years ago this summer that subsidence completely swallowed a 15 tons Wigan Corparation steamroller, together with its driver! Pit shafts around Wigan come in all shapes and sizes. This one, at Worsley Mesnes, big enough to with ease, was capped in 1973. The dangers involved can be gauged from the fact that the workmen are wearing lifelines. Most Wigan streets were cobbled then, with some of the town centre thoroughfares were macadamed and it was when Hope Street was being resurfaces in this way that the accident happened. 0n that summer afternoon of Thursday, June 30, 1910. a steamroller driver Peter Ball, who lodged in Hodges Street, was reversing his machine into Mesnes Terrace about 4.0pm when the earth's crust gave way. The steamroller, with poor Ball aboard, dropped backwards into the yaw ning hole and within seconds it had disappeared altogether in a huge cloud of dust which hovered over the street like a polluting vampire. The steamroller cab was ripped clean off. Rescuers had to work like mad for two hours to recover the driver, who was treated for his injuries at Wigan Infirmary and was lucky to escape with his life. The steamroller had to be taken to bits and brought out piece by piece. So, as there are at least 1,013 known old mineshafts in the former Wigan coalfield and a good many more that the authorities don't know about - work on our new town centre might uncover more such hazards to add to the list. Wigan Observer 21st Mar. 1985. 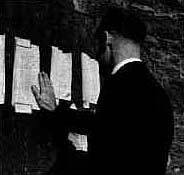 Above - Posting Names Of The Dead. Whitehaven Disaster. 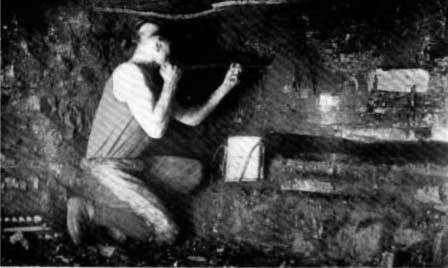 I have been attempting to trace the sad death of a young schoolboy who, while bird nesting, scaled a disused mine shaft; whilst on top of the wall he fell to his death, the old mine went by the local name of OWD NATS, AT WORSLEY MESNES, WIGAN IT WAS IN THE 1980s. I only know the lads surname it was CONWAY. On 31st of May 1972 (possibly 1971) John Conway fell down Worsley Mesnes Shaft, which was next to Smithy Brook very near to the Brookside sheltered housing complex but the search went on until the end of the next day. 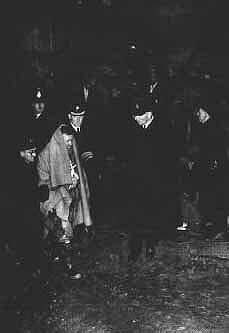 The shafts men from Parkside Colliery were sent to try and recover his body but there was too much water in the shaft. (Wigan Observer) Above photo shows the shaft being filled in after the accident. John and two other lads were bird-nesting over the pit shaft, they were trying to get to a kestrel's nest. The shaft was at the back of where St Clements court is now on Worsley Mesnes Drive. The family used to live on Walpole Ave but then they moved to the Scholes area. Micky East said the problem with the shaft, locally called Owd Nat's, was that it was not capped, it just had a wall around it, you could easily climb to the top of it. 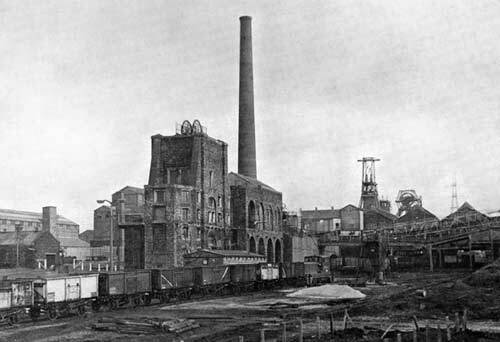 I well remember Mick Waddington and a mate dancing on the timber across the shaft, about 18inches wide, above that dark abyss. When mother found out she hit the roof and barred us from going down the lane.